In order to be cooled most efficiently, the case and CPU fan is designed to be structure which considers the installed state of each part. It cools from the left side, inhalation from the right side surface. This is XC Cube exhaust structure working. In addition, 275 watt power source has added an 8cm FAN. With 4 copper heat pipes, the heat generation from CPU is transmitted through tubular copper heat pipe. It reached to the point where it releases heat to a heat sink altogether copper. 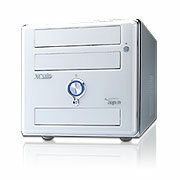 Because of that, the advanced press CPU (such as Pentium 4 560) is efficiently cooling. Considering that the inside of cube is narrow, installation had adopted simple clip system. XC Cube motherboard goes with UX915 of LGA775 socket. It is advanced motherboard which corresponds to the Hyper Threading Pentium4 processors. With the up-to-date technology Intel 915G chip set utilize the efficiency of the FSB533/FSB800, and ICH6 was southern bridge. The advanced graphic card can be installed with the PCI Express x16 slot. Giga bit LAN, serial ATA high-speed hard disk support, 4 ports USB2.0 4 ports, and DDR400 correspondence up to 2GB memory supported.